Gregory Campbell limped off the ice after his gutsy performance when he broke his leg by blocking a shot. You don’t hesitate. You can’t. 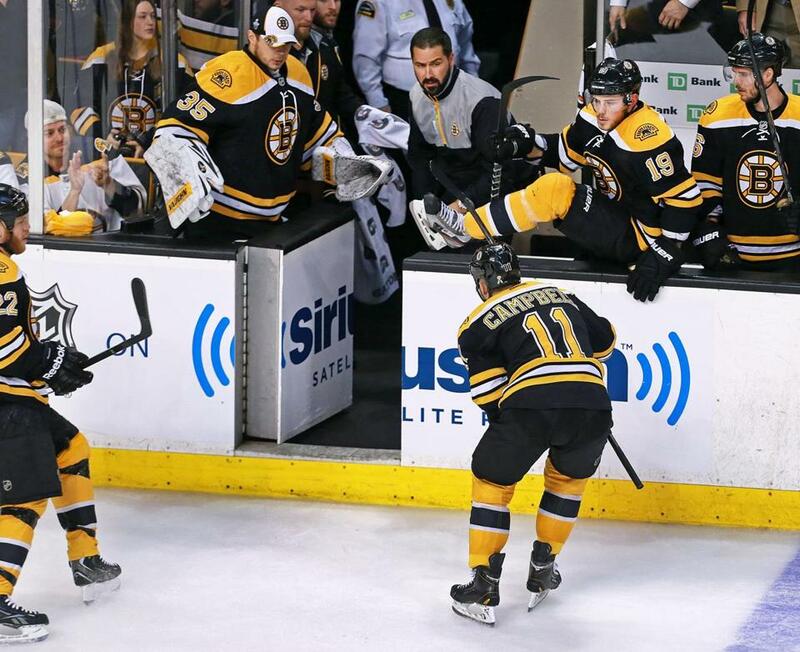 Despite the knowledge that blocking a shot could lead to injury — to a broken right fibula in the case of the Bruins’ Gregory Campbell — there is no room to think about what could be, what might happen. You just go. 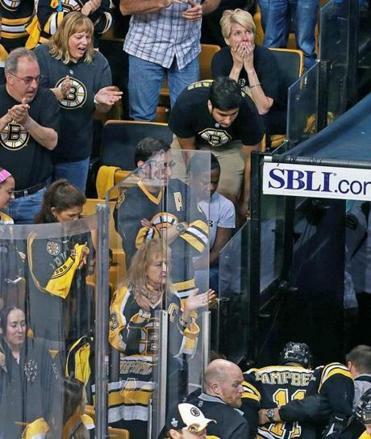 “I don’t think you let those thoughts creep in,” said Shawn Thornton, Campbell’s linemate. “You do whatever it takes this time of year to win games. If that’s blocking shots, you do it. Campbell did just that, taking on a slap shot from Evgeni Malkin in the second period of the Bruins’ 2-1 double-overtime win over the Penguins Wednesday night. And then, with a broken leg, Campbell played another 50 seconds before he could make his way to the bench. Bruin Gregory Campbell sprawls on the ice, absorbing the impact of an Evgeni Malkin slap shot during a Penguins power play in the second period on Wednesday night at TD Garden. “I don’t know how many people have broken a leg, but it’s not easy to stand on, let alone skate around on,” Thornton said. “It takes a lot of heart to skate off on your own. And he tried to block another one after that. Now that the injury is known and it’s official that the Bruins will be without their fourth-line center for the remainder of the postseason, coach Claude Julien will have to choose among Kaspars Daugavins, Jordan Caron, Jay Pandolfo, and Carl Soderberg to replace Campbell in the lineup. Julien, though, was not interested in sharing his plans. Asked about the options, Julien would say only, “Lots. We’ve got lots of options. We’ll look at it closer today and make a decision tomorrow. Fortunately for the Bruins, those decisions will be made with the team leading the Eastern Conference finals, three games to none. Still, the loss of Campbell is a big one. He was one of the team’s top penalty killers, and part of that key fourth line. As Thornton said, “I’ve played with him for three years. I’m going to miss him. There’s a lot of times on that ice that we read off each other very well with little communication. Appreciative Bruins fans watch as Gregory Campbell is helped down the tunnel after breaking his leg. Plus, there’s always the possibility that watching a teammate get knocked out of the playoffs could make a player gun-shy when it comes to putting his body in the way of the puck. That doesn’t seem to be a concern in the Bruins locker room. Said Dennis Seidenberg, “You don’t really think of getting injured. You try to block the shot, and you know you can get hurt, but you don’t think of that. You try not to think of those scenarios and just try to do your best blocking. And that sacrifice means the Bruins won’t have Campbell for the rest of the postseason. But that’s what can happen when players put their bodies in the way of frozen pucks whizzing at them at dangerous speeds. So, when asked about striking a balance between the need to keep shots away from the net and the possibility of injuries like the one suffered by Campbell, Julien acknowledged there’s not really a balance to be struck. You just get down on the ice. You just block the shot. That’s what hockey is. “There’s always the potential for injury in the game of hockey,” Julien said. “If it’s not blocked shots, it’s something else — it’s taking a hit, it’s giving a hit.